Hi friends! I hope all of you had a WONDERFUL Thanksgiving. I wanted to do a quick update and share with you some changes. If you’ve been reading this blog for more than a few months, you may have noticed a change in content. This started out as an acting blog. Lately it’s been about sharing my experiences from day to day, what I learned, and where I go from there. I made this switch in content without making any real announcement. 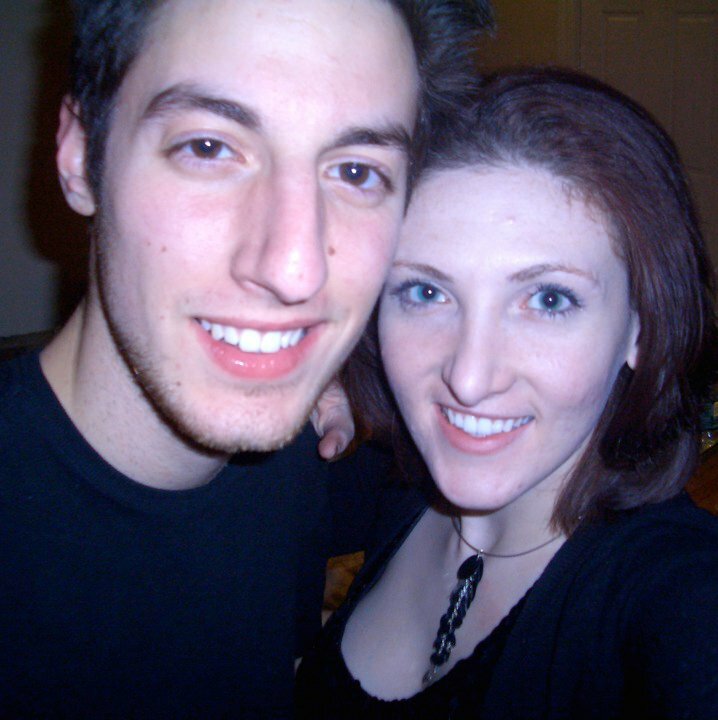 So I recently changed my “about me” section of the blog. It says more of what I just talked about, and less about acting. To go along with the theme of change, I also switched up the layout a bit. Be on the lookout for more changes coming up! For my acting friends, I still blog about my acting endeavors – just not here as much. For posts on acting, check out www.greenroomblog.com, where I write under the nickname “The Chicago Actor.” You’ll see the nickname pop up on this blog too, since both blogs are used through wordpress. I recommend actors check out all the writers on Green Room Blog, as the relatable writing is what made me apply to them in the first place. Also if you haven’t noticed, Fridays is the new day where I post. Next Friday I’ll have a new one here. Talk to you all again next Friday! This is a very touchy subject. Be sure to breathe deeply as you read. Take breaks as needed. My friends, we’ve reached that time of year. It’s almost Thanksgiving. The weather is colder. Some of us have already had our first snow of the year. Many more of us are pissed that we’ve already had our first snow of the year. Regardless, I’m pretty sure all of us have seen a lit up Christmas tree at a retail store already. I’m sure there were many who saw this sign of love, peace, and happiness, and immediately ran outside of the store to purge. After all, why should you have to look at a Christmas tree when it’s not even Thanksgiving? PSA: You’re allowed to enjoy being in the Christmas spirit before Thanksgiving. …if you haven’t thrown your laptop out the window in a fit of rage after reading the above statement, please continue on. 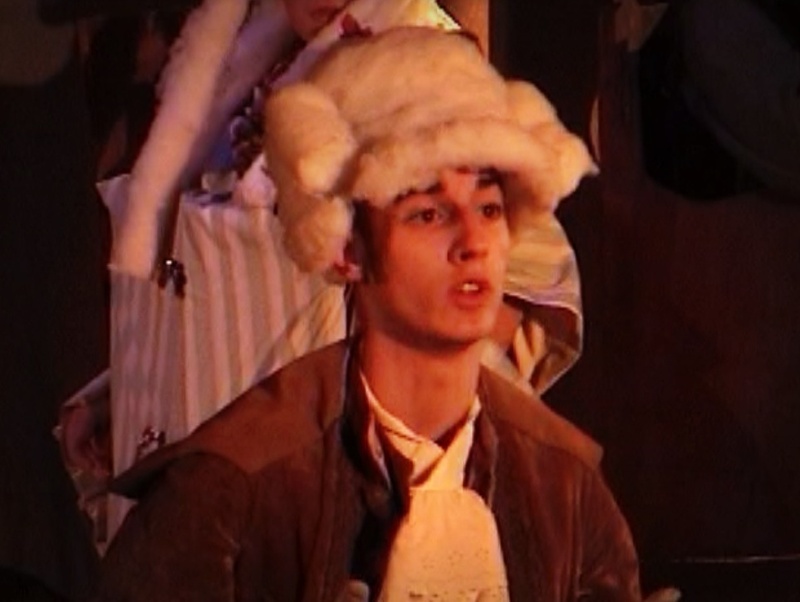 When I was a sophomore in high school, I got cast in a production of “A Christmas Carol” at Stoneham Theatre. We spent our first rehearsal singing Christmas Carols and learning the harmonies. I remember everyone leaving in quite the jolly mood. Upon returning home, I felt odd. I was walking up my front steps, looking at decorations and lights that were still up from Halloween. After all, it was still early November. We still were a couple weeks away from the half day of school, indicating that Thanksgiving was the next day. I loved Thanksgiving. I was in marching band and we got to play at the football game. We always enjoyed a pancake breakfast before the game. On Thanksgiving. So. Cool. Fast forward to a year later. I got cast in “A Christmas Carol” again! Not only do I get to take part in an awesome show for the second year in a row, but this also meant getting to be in the Christmas spirit early again! After all, I needed an excuse to be in this spirit. Right? …and you better believe I was still in the Christmas Spirit before Thanksgiving. I’m currently taking classes with the Green Room Professional Program under Steven Ivich (I highly recommend this program to any actor in the Chicago area). Something that Steven teaches us is entity work. We do multiple exercises where we create an entity, eventually using this entity for script and character work. When we return to entity work, we’re instructed not to doing anything to force the entity to come. Instead, we’re told to wait for it to come to us. 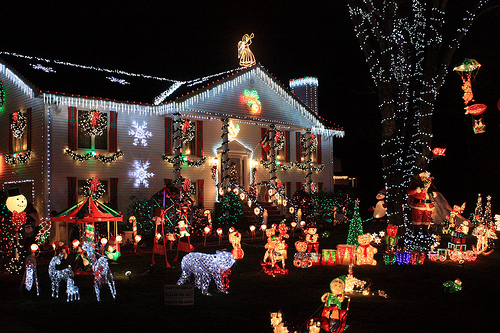 So guys, let’s all get in the Christmas spirit – when we’re ready. If you still think that you should only celebrate one holiday at a time, totally fine. 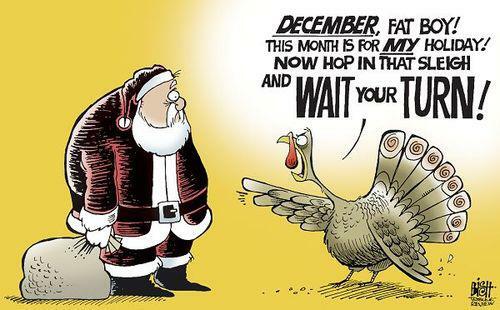 Just don’t kick your friends when they start singing “All I Want for Christmas is You” on November 1st. Merry Christmas a month early, friends! Recently, I fell into a funk. For purposes of this blog, we’ll use the Tony Dictionary for “funk:” (n) A time where you’re not quite yourself, feeling a bit down and/or off. This creates a negative environment where doing anything productive is damn near impossible. While I’ve definitely had my share of setbacks, a funk is a little different. A setback (according to the Tony Dictionary) means you’re falling off track and your mood hasn’t necessarily changed. I haven’t suffered a funk like this in a while. I won’t mention how I got there. Anyone can fall into a funk for all sorts of reasons. The important part is learning how one gets out. I just wanted to get back to feeling like Tony and get back on track with my goals. Spoiler Alert: I got out of this funk. It was much easier than I thought. I tried calling friends from home. Okay I lied. I’ll tell you part of how I got into this: I’m homesick. I miss my friends terribly. 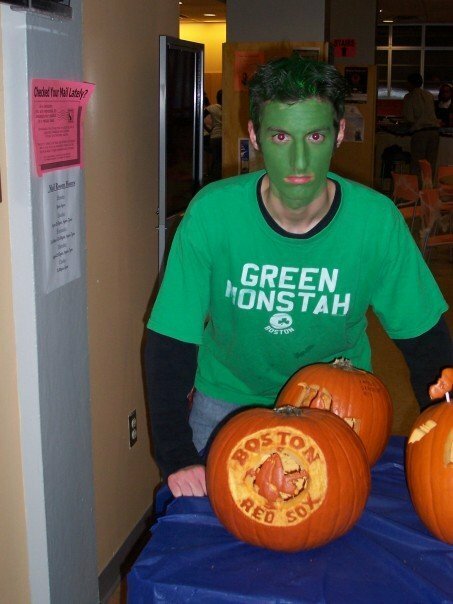 And I’m not happy at all that the Red Sox had a parade without me. (Did they even see my facebook statuses??) One of those friends that I miss terribly is Nicole. Nicole is a dear friend who I need to call every once in a while. There are two scenarios in particular where I always call her: 1) When something comes up and I need her advice. 2) Whenever I feel like calling Nicole. She responds gracefully to both. So I talked to her for a while, and felt much better after. Unfortunately…that didn’t get me completely out of the funk. An episode of “Walking Dead” later, I had forgotten about most of the call. I was focused on zombies that were likely hiding in my kitchen. And while I love “Walking Dead,” zombies never put me in a good mood. I tried getting out of the apartment. I love my apartment more than I’ve loved any other apartment I’ve ever had (Essex Street in Salem is a close second). However, I’m far more productive getting things done elsewhere. Hence my many, many visits to Starbucks. In fact, one of the baristas saw me come in the other night and announced to the staff, “Everyone, Tony’s here! This night’s about to get awesome!” The other baristas didn’t seem to believe this. I went to work the next day. “But Tony, this doesn’t count as ‘trying to get out of the funk!’” I know, and you’re right. I went to work in a not-so-great mood. Luckily, I have some pretty cool coworkers. I was joking around with them a bit, and before you knew it……my funk was gone. I was pretty surprised once I realized this. I wasn’t happy to be there, nothing particularly good was happening, and it was still a good two hours before I had gotten the table of three girls drinking mimosas who all left me notes on their receipts. Do this for your server, and I guarantee it will make their day. So what exactly happened here? I eventually started focusing on things other than my bad mood, and I felt better. Even though I had gotten very little sleep the night before, I still felt motivated enough after work to go to the gym. Guys. We’re gonna fall into funks. They’re not fun. But if you simply go about your day rather than focusing on getting out of it, they might just go away. I realize that my actions may have annoyed the crap out of you. I understand that explaining my passion for baseball will not make up for my actions. However, I hope that doing so will shed some light on my behavior. First things first, I tweeted a couple of days ago that I grew up thinking I was going to be a baseball player. Not an actor. 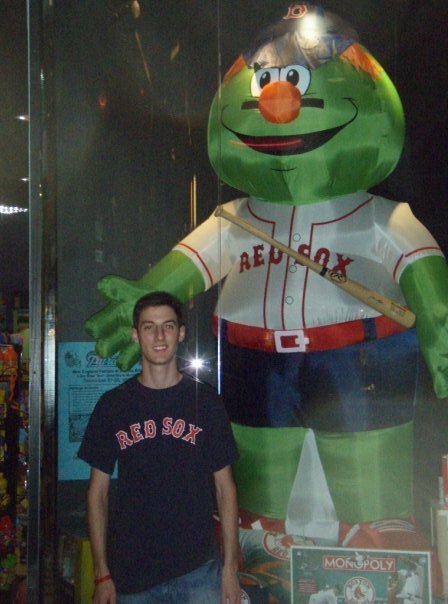 I was brought to Fenway Park as a baby, so I don’t remember my first game. 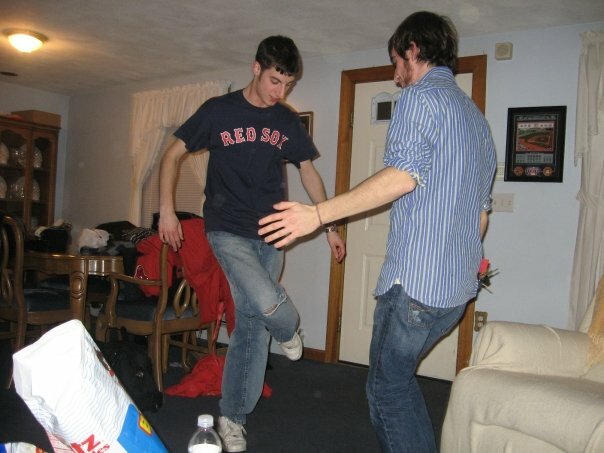 I just remember cherishing baseball and being in love with the Boston Red Sox. By the time I started high school, I had given up the dream of becoming a baseball player and was getting more into acting. 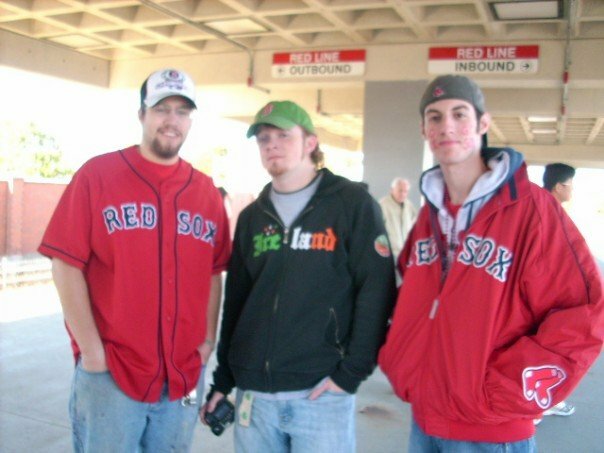 Despite this, I remained a passionate Red Sox fan who owned far too many Red Sox shirts and jackets (most of which were about five sizes too big for me. 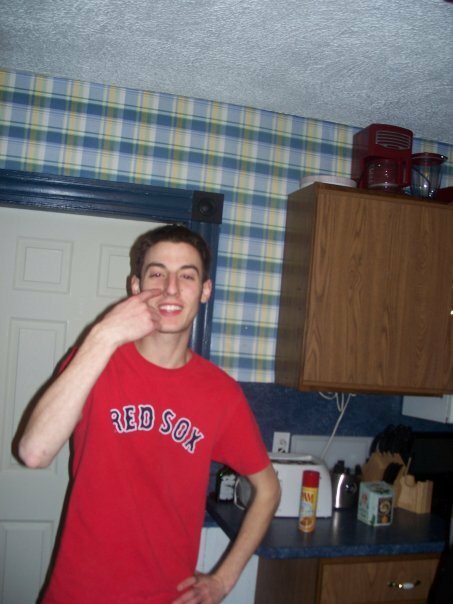 You’ll notice this as you scroll down) As I entered college, I wore Red Sox shirts damn near every single day of the week. 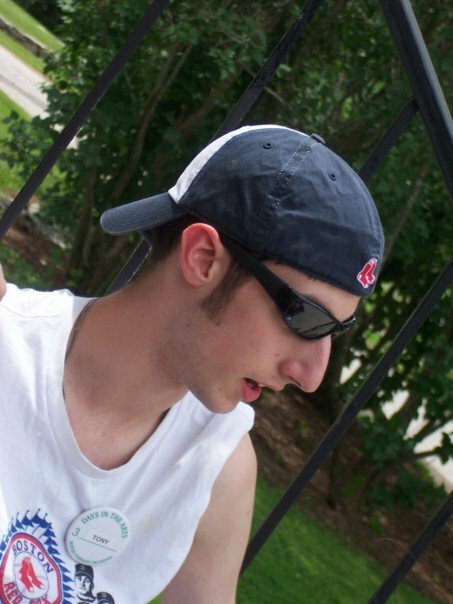 Here are a few of my default photos from college. As I started making friends, I quickly bonded with other actors. Eventually I also started growing close to the techies. 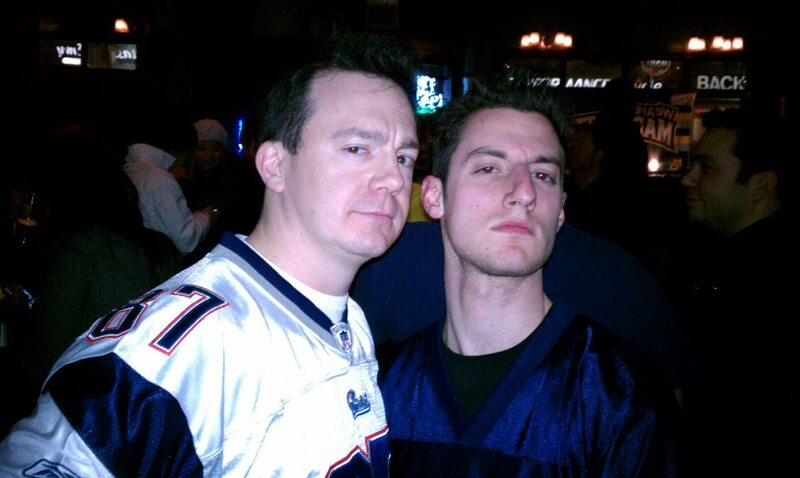 While there were actors who liked sports, there were far more techies who shared my passion for baseball and the Red Sox. 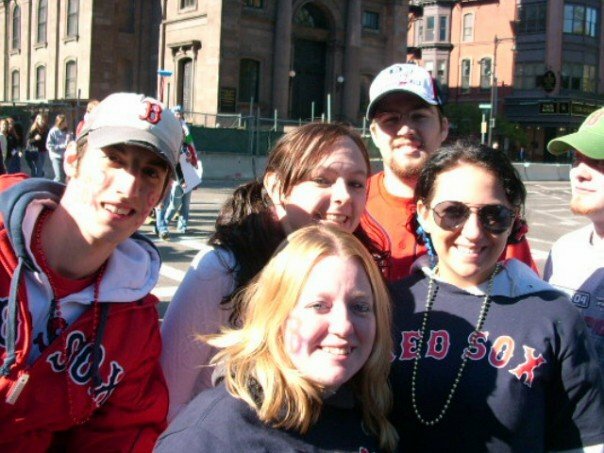 In 2007, I grew even closer to some of them as we won our second World Series title…at least in our lifetime. We wouldn’t win another for a while, but that didn’t stop me from wearing the shirts. …guess which one is me? Also, you can’t tell, but my shoes had Sox logo’s on them too. Obsessed much? And then there was the time I was on TV. See the guy standing in the gray jersey at the bottom? I’m right above him in a white jersey. Look at the score. LOOK AT THE SCORE. THIS GAME WASN’T EVEN CLOSE AND I’M STANDING AND CHEERING! Then the inevitable happened. I moved to Chicago. Without the Red Sox. I had no friends yet, so I went to a White Sox vs. Red Sox game by myself. Oh right. I met Justin and Emily. They were both Red Sox fans and were sitting next to me. 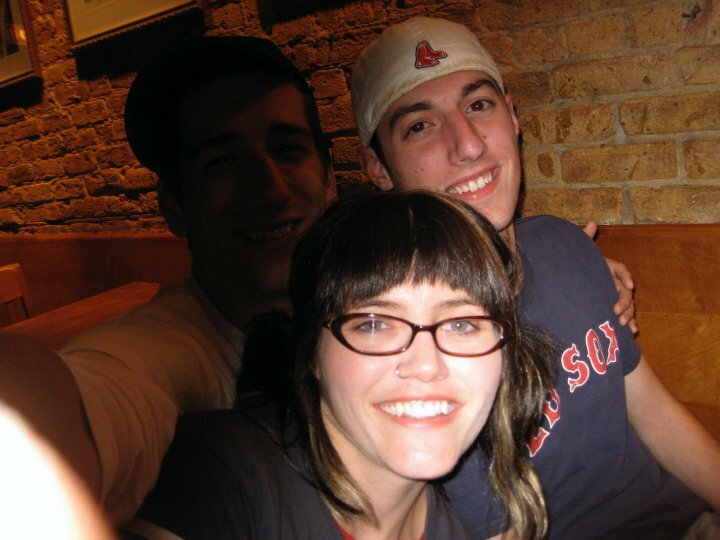 They were my first two friends in Chicago. I like to use the phrase “my friends” a lot when I’m writing. I’ve always felt that friendship is one of the most important things to me. So when I moved to Chicago and had no friends, I felt pretty darn lonely. But then I started making friends. 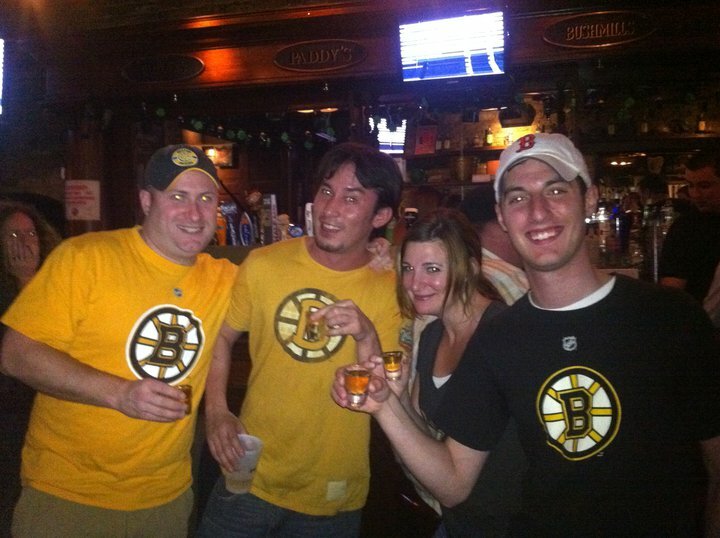 Friends who loved Boston sports just as much as I did. 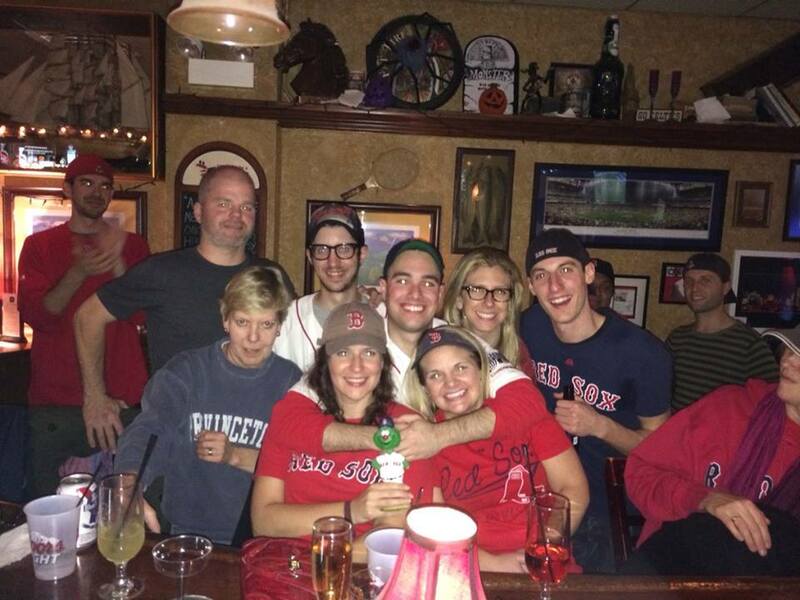 Because wouldn’t ya know…there is a RED SOX MEETUP GROUP IN CHICAGO! Through a couple of meet up events, I met some cool people. Which led to meeting more cool people. Which lead to some great times. 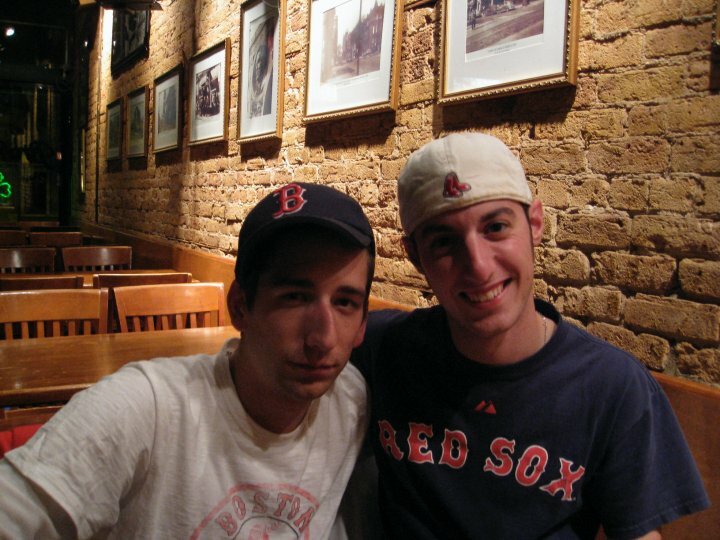 This one was taken shortly after the Sox won the World Series. “UGH. Tony. We get it. 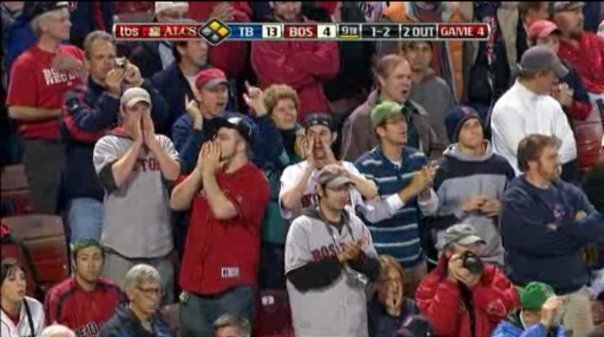 You have lots of pictures of Red Sox clothes and pictures that you clearly stole off facebook. What’s the point?” My point is that I likely wouldn’t have met any of these people had it not been for baseball. Think about something you’re really passionate about. Chances are you made a lot of friends because of it. What would your life be like without these friends? Personally, I can’t think too much about life without all my theatre friends without crying. Thanks for bearing with me, friends.